Do you remember back in June I posted about Hpnotiq's GlamLouder nail challenge? 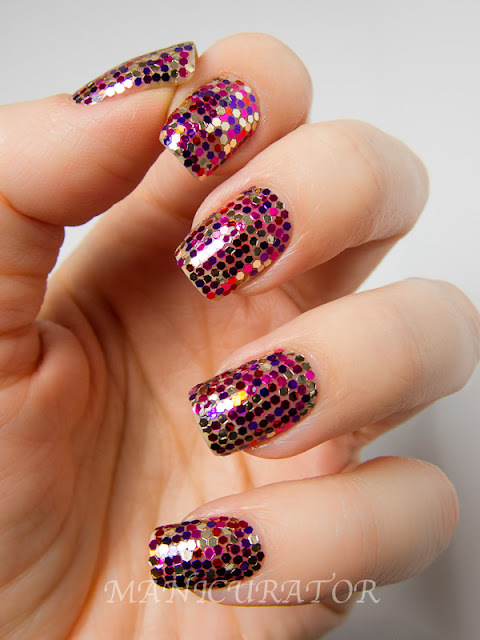 This was my Glammest mani that I shared with you, hand placed glitters! Thanks so much for participating in Hpnotiq's Bling It On! Contest & Sweepstakes. Hpnotiq loved your entries – and had a fabulous time seeing what inspires your inner glam self! Winners from the Glammest Look, Nails, Makeup and Shoe Challenges are now competing in the final round for a chance to win the grand prize trip to go shopping with Khloe Kardashian in Los Angeles! Now it’s time for you to vote on the glammest of the glam to help Hpnotiq decide who is going to get the chance to be the big winner and fly to LA for a makeover and photo shoot. Don’t forget to share with all of your glammest friends; every vote counts! Voting is open from August 12 until August 21st, 2013. How fun right? Did you submit nails? Good luck if you did! Are you going to vote? I haven't been able to get in on their site to vote yet or see all of their pretty submissions! I hope they make them live soon, I really want to see all of the entries.